Offering the highest payload in the industry, Liebherr showcased the ultra-class T 284 mining truck available with new features and options at MINExpo 2016 in Las Vegas. Developed and built by Liebherr, the proven Litronic Plus AC drive system determines the optimal way to extract power from the diesel engine. With this system, more power is available to accelerate the truck and climb grades. The Litronic Plus system also conserves fuel when the engine is idling, minimising fuel consumption and maximising performance. Combining the Litronic Plus AC drive system, high-power engine and low gross vehicle weight, this leads to fast haul cycle times with higher speeds on grade when compared to others in its class. The T 284 supports engine options with power ratings up to 3000 kW. With application-specific recommendations by Liebherr, customers are able to select the engine that will allow the truck to meet productivity targets, while minimising fuel consumption. These engine options offer the latest fuel-injection technology for cleaner combustion and reduced fuel consumption. The T 284 also supports high-capacity tyres. 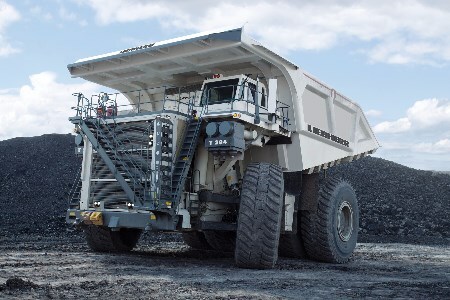 Liebherr's design goal is to use as much of the truck’s load-carrying capacity as possible for payload. The T 284 achieves this by combining its trademark low empty vehicle weight (EVW) and electric drive system. The key to this empty vehicle weight is the T 284’s lightweight frame, which includes cast components in strategic areas and hollow box rails with fully welded internal stiffeners.